Steve Bogan takes over at Bonita. (La Verne) – Bonita hired Steve Bogan as its head football coach Friday sources confirmed. 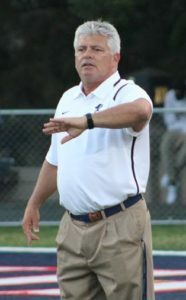 Bogan resigned as head coach at Maranatha earlier this month where he spent the last four years compiling an overall record of 27-17-1. Prior to that Bogan spent the majority of his head coaching career at South Hills where he won four CIF championships and 13 league titles in 19 years before stepping down in 2012. Bogan takes over for Ibis Aguilar who was released after going 3-7 in each of his two years at the helm. 8 Comments to "Bonita Lands Bogan"
Has he been introduced to the team? The cupboards were bare at Maranatha, rat leaving a sinking ship… Who will replace him with the Minutemen? Safe choice by Podley but when I would have seen Charter Oak wunderkind Lehigh’s application my search would have been over. He would have brought the discipline,energy and fight sorely needed of late to Bearcat football. The cupboard is by no means bare at Bonita and Bogan and Podley are happy but will Bonita football be? Yet you’re still coming here and reading stories. That school is a goldmine. Should be dominant!